Food52 recently had a contest for your best recipes using hearty greens. I had a bazillion ideas, but less free time than ever and a promise to myself to do a better job with priorities. I did, however, have kale and spinach and I do have to eat and feed my family so a few recipes got through. The results of the contest are not yet published, so I will type with crossed fingers. And regardless, these are just good recipes that will continue to be in my repertoire. 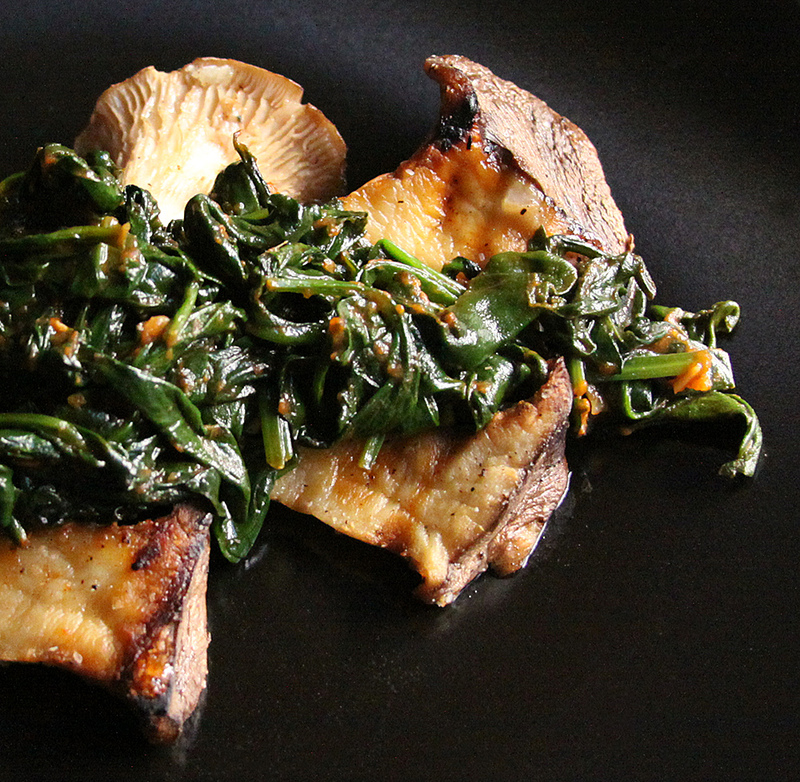 This first recipe is a silky, umami-rich condiment made with spinach, garlic, anchovy and tomato. It was great on some really meaty, grilled mushrooms and paired well with steak as well (duh). Melt butter in olive oil and add anchovy, chopping up and stirring until it melts. Add garlic and cook until fragrant. Mound greens on top, cooking for a minute before gently stirring and flipping while they compress. Stir tomato paste into 2 tablespoons warm water and stir mixture into greens when they have all just wilted. Continue cooking for another couple minutes. Add slight pinch sugar and salt and pepper to taste. Don’t be shy- it is a condiment meant to accompany and boost the dish and should be well seasoned. One day for lunch I was craving a big pile of kale in a salad. I used to make this dressing for spinach quite a bit and have long been a sucker for the creamy, sweet, nutty combination in a salad. I will say that bacon takes this salad to a whole new level, but it is equally satisfying without thanks to the rich taste of the sesame paste. Remove stems from greens, lay in a flat pile and roll up tightly. Slice crosswise into very thin strips. Whisk tahini, honey, juice, sriracha and oils until smooth. It will be quite thick. Add water a bit at a time until it is smooth and creamy, but not too runny. 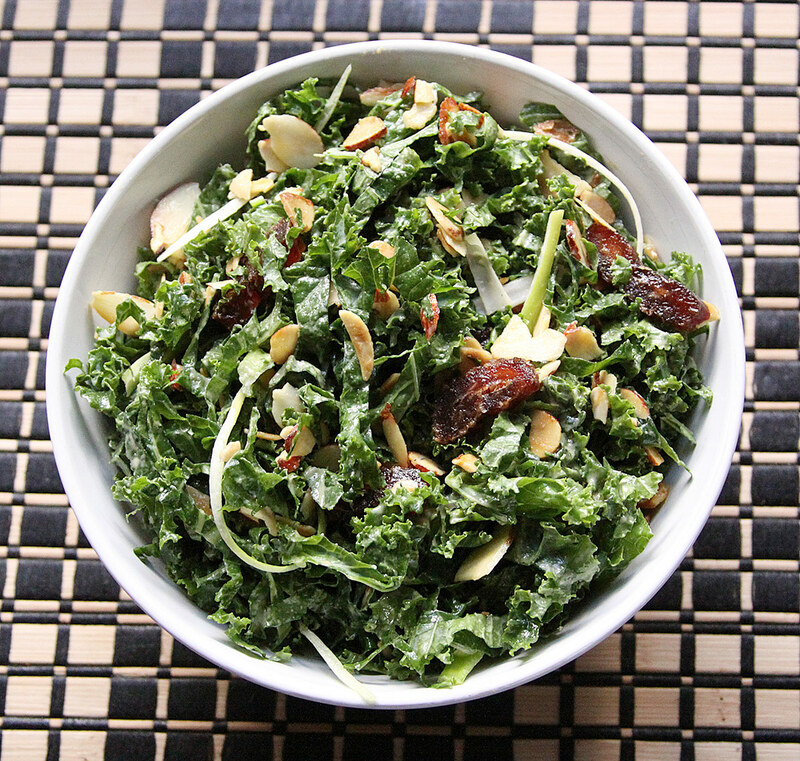 Toss greens, almonds, dates and green onions* with dressing. Season with a pinch of salt and some cracked pepper. *I often will rinse green onions to reduce the bite when served raw. Another salad I have made for years also using spinach is a version of the Japanese Gomaae. It is the small, but depthy sesame salad often served at sushi bars and Japanese restaurants. I have tweaked it with all sorts of ingredients, but really liked the citrus in this version. You can make a big batch of dressing and have it on salad, tofu or leftover chicken throughout the week. You can use the greens raw, but when using kale I will usually blanch it for a minute in boiling water, then shock it in ice water. 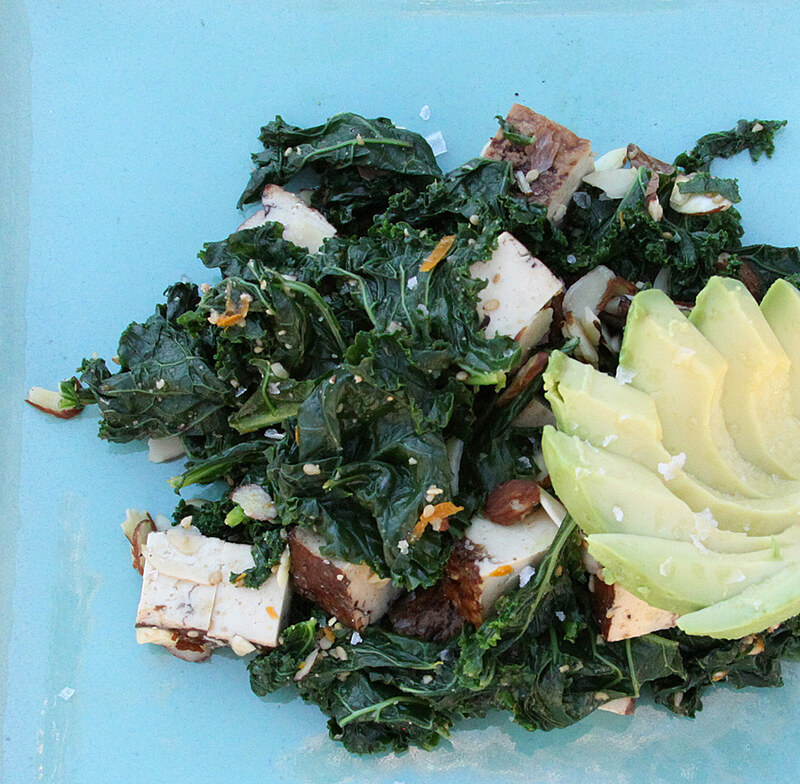 Chop greens and set aside. Gently toast sesame seed in a dry pan until fragrant, being careful not to burn. Transfer to a mortar and pestle and grind with sugar. I usually leave some seeds whole, grinding the rest to a sand consistency. Stir in vinegar, soy, 1 teaspoon zest and 1 tablespoon juice from orange. I use a generous tablespoon for one cup of tightly packed greens. Toss together and eat as is or top with your favorite ingredients. This entry was posted in Japanese, Salad, Soulful & Simple, VB6, Vegetarian by Marina Chotzinoff. Bookmark the permalink.